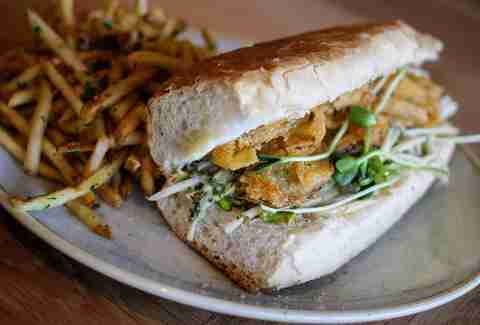 We all know New Orleanians can be somewhat snobbish about their golden child, the po-boy. But with Houston being just down the coast from the Crescent City, we wondered: can you still get a decent po-boy just a few hundred miles away? So we opened up our minds and stomachs and broke out our sweet Inspector Gadget coat to find out what constitutes a “good one,” and if Houston lives up to its predecessor. What is a po-boy anyway? The cheap po-boys were already popular among the workers, but when the depression hit, those babies spread like Crystal-inflamed wildfire. And thus, NOLA’s beloved sandwich became part of the city’s delicious, delicious history. Today, the humble sandwich is either gobbled up blissfully or picked apart as ‘inauthentic’ by devoted po-boy fans who cling to the sandwich’s essential anatomy, those few ingredients that our neighbors out east take mighty seriously and consider essential to make “a real” po-boy. 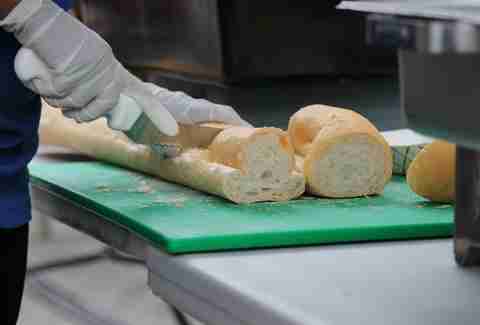 Back to history: when the Martins noticed that the tapered ends of a traditional French baguette would result in wasted bread, they partnered with third generation baker John Gendusa to create the more even, square-shaped loaf that we know and love today. Folks from the Big Easy will tell you the bread must be the perfect combination of crackly, not crusty, and with a doughy center to stand up to (and soak up) whatever fillings you pile on. And those even more die-hard will tell you only French bread from NOLA’s infamous Leidenheimer Baking Co. will suffice (which, by the way, is kind of like saying you can only make sizzurp while listening to DJ Screw, but we digress). The truth is, the secret to the bread is that it actually likes humidity. Because New Orleans lies slightly below sea level, it creates a uniquely humid atmosphere that affects the yeast and prevents the loaves from forming too hard a crust. You know what other city is has that type of humidity that’s more smothering than your mother at the holidays? Yep, Houston. Our similar climate means we can produce the same crackly, yet soft and doughy loaf. Admittedly, Houston doesn’t always get it right. But when we do, it’s pretty damn close. Our very own baked royalty Slow Dough Bread Co. provides the baguettes for many shops (and most of the best restaurants) around town. Co-owner Heath Wendell cut his teeth at boulangeries in Paris before opening up shop in 2009. Through what we can only assume to be elfin magic, their French loaves have that much sought after mix of light-, soft-, crisp- and chewiness. Today, places like Antone’s Famous Po' Boys, who have been filling sandwiches with deli cuts and their signature chow-chow since 1962, use Slow Dough’s freshly baked baguettes for all of their hot po-boys. As does The Honeymoon Café & Bar, downtown’s NOLA-style coffee & cocktail bar that makes neo-traditional takes on authentic po-boys. Then there’s BB’s Cafe, who has their French bread shipped in straight from the mother source itself: Leidenheimer Baking Co. We’d like to hear our neighbors talk smack about the authenticity of their bread. LA-native and owner Brooks Bassler did extensive research in New Orleans’ best po-boy shops before opening up shop in Houston in 2007, so the toppings are pretty authentic, too (but more on that later). The Cajun Stop’s (formerly Calliope’s) Lisa Carnley also has her roots in Louisiana. Raised in Houma and displaced by Hurricane Katrina, she landed in Houston in 2009 and opened up shop at the hidden corner of Jefferson & Hutchins. Carnley won’t divulge where she gets her bread from (we don’t blame her), but she has confirmed it’s a Houston purveyor. Many traditionalists say her po-boy is one of the most authentically New Orleans you’ll find in town thanks to the combination of spot on French bread and fixin’s. While quality of the French bread may be the more important of the two components, po-boy purists also prefer their sandwiches be stuffed with the most traditional Cajun and Creole ingredients. Things like roast beef, baked ham, hot sausage, and fried shrimp, oysters, crawfish, catfish, and soft-shell crab are best sloppily “dressed” with lettuce, tomato, and mayo. We’d say Houston does all of that good stuff justice. The Cajun Stop wows with extra sloppy roast beef, double fried shrimp, and a Surf & Turf stacked with both. The house-made andouille sausage po-boy from Abe’s Cajun Market is fiery in the best way. 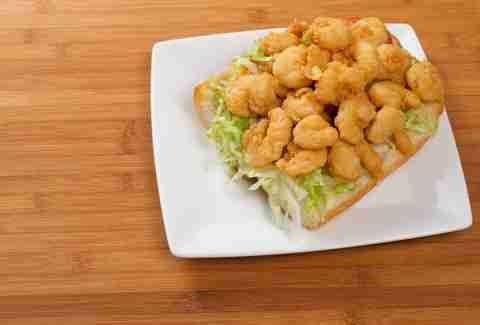 And Calliope’s Seafood & Po-Boys makes a fried oyster and fried shrimp half-and-half that will bring you right back to your last trip to the Crescent City. A local favorite is BB’s Café’s Midnight Masterpiece, a messily stuffed five-six hour slow-roasted chuck that gets shaved into “debris” a la the Big Easy’s famed Mother’s Restaurant. That debris, along with the bread, soaks up all of the gravy before it’s finished, fully dressed with BB’s spicy mayo, lettuce, tomato, and pickles. While you should get the debris on a po-boy, also order it atop your fries along with some chile con queso -- this is Texas after all. 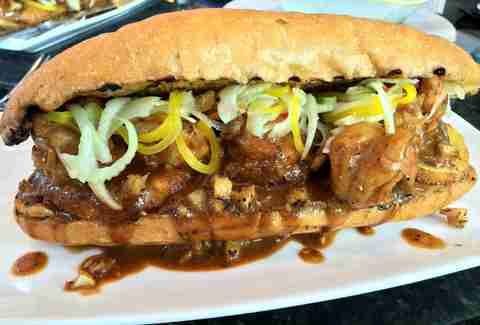 So, is it the history and legacy that sets the po-boy apart? Houston has its own history of shaping and blending foods. Dishes like those rich, tangy, saucy fries are, perhaps, where the city shines best: when it breaks all the rules and brings cultures together to create a melting pot of cuisine better than any other city can. Isn’t that what Louisiana Creole is all about? The amalgamation of cultures? Creole cuisine may have been New Orleans-born, but the concept Creolization is totally Houston-bred. Let’s take a look at Houston’s Vietnamese influence, for instance. Because banh mi are basically po-boys with pickle-y things, right? Head to any shop, and you’ll find the same French bread slathered with butter and pâté and piled with char-grilled pork, pickled cucumber, carrots, jalapeño, and fresh cilantro. Food truck turned brick and mortar stop Les Ba’get started taking things beyond tradition. They make an incredibly excellent French bread sandwich loaded with mind-numbingly good oak-smoked brisket and all of the classic Vietnamese accoutrement. It’s France meets Vietnam meets Texas... and it’s a beautiful thing. Then there’s Viet-Cajun crawfish haunts like Cajun Kitchen, which shows off a menu full of old school fried fish, crawfish, and shrimp po-boys in lieu of banh mi. And of course there are the restaurants that elevate the poor ol’ boys into something a bit more. Holley’s Seafood Restaurant & Oyster Bar's take gives you all kinds of feels with NOLA-style BBQ shrimp, fried green tomatoes, grilled lemon, and cane syrup-mint aioli. 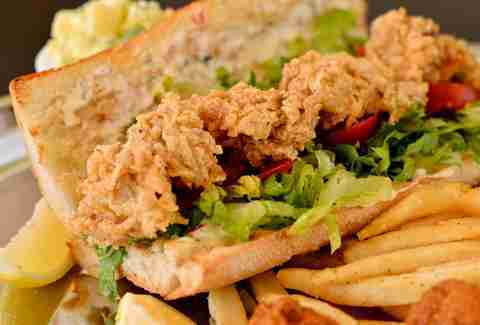 Liberty Kitchen’s fried oyster po-boy gets a big, fat Texas punch by combining remoulade with bacon jam. It’s “so Houston” in the best possible way. And newcomer Bernadine’s knocks it out of the park with its Fried Green Tomato and Peacemaker ‘boys, the latter of which is stuffed with fried shrimp & oysters and house-made pickles. 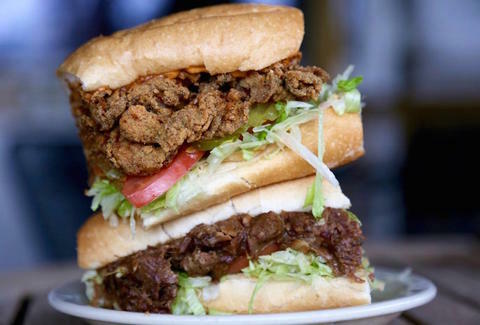 With all of that in mind -- the crunchy bread, the fixin’s, Houston’s food-centric and truly awesome Mutt City culture – we can say with a clear conscious that if there’s any city that can match the majesty of the Crescent City po-boy, it’s NOLA’s bigger, cool-in-its-own-way brother, Houston. Brooke Viggiano is a Houston writer who wouldn’t balk at a Houston or a New Orleans po-boy because she’s pretty hungry right now. Follow her @BrookeViggiano whether you agree with her or not.